The FARC and the Colombian government deserved to share this year’s Nobel Peace Prize. Unfortunately, however, the prize was awarded to only one party. In general we are idiots if we let political correctness govern our views about how the world works. We confuse facts with latent sympathies – a widespread form of intellectual dishonesty, disguised as good manners. Political correctness also influences our thinking about the current and past state of the conflict in Colombia – and about who deserves to share the Nobel prize. As is well known, the FARC rebels and the government are not the only parties active in the conflict in Colombia. Other guerrilla movements, such as the ELN, are also involved, as well as various paramilitary groups and drugs gangs. Accordingly, achieving peace requires striking a difficult balance between what may be consistent and fair and what may result in a lasting settlement. Insisting on complete justice today, as former Colombian president Alvaro Uribe did, may create an obstacle to peace in the future. At the same time, lasting peace may depend on reducing the grotesque inequalities in Colombia with regard to income, wealth and political influence – inequalities that in the past led to the conflict. Even in Colombia, however, many people believe that the FARC started the fighting. But the FARC was founded in 1964, long after the fighting commenced. Between 1948 and 1958 alone – a period known as “La Violencia” – more than 200,000 people lost their lives in violent confrontations between the Conservative and Liberal parties in Colombia. Subsequently these two parties formed a coalition in order to prevent other, more radical, parties from gaining influence. So the FARC did not start the war – it was the war that started the FARC. The organization was founded by poor farmers as a self-defence initiative. The farmers were under attack by government forces, backed by the United States, targeting rural communities with Communist sympathies. Of course, this does not alter the fact that FARC rebels have committed many atrocities. But which side has really been responsible for the most violence? Long ago the United Nations calculated that the FARC and the ELN were responsible for 12 per cent of civilian killings. The rest were caused by government forces and paramilitary militias acting in concert with criminal gangs. Finally, it is politically correct to believe that people from all parts of Colombian society voted against the peace deal last weekend (50.2 per cent voted “no”, with a turnout of 38 per cent). The figures suggest otherwise. With the good help of economist and political scientist James Robinson, it is easy to see that the percentage of “yes” votes was high in provinces with many poor voters, while the percentage of “no” votes was high in provinces with few poor voters. The division between urban and rural areas was equally clear. The largest cities (with the exception of Bogota) had a majority of “no” votes, while most rural provinces had a clear majority of “yes” votes. Since nearly three-quarters of Colombia’s population live in urban areas, the preponderance of “yes” votes in rural areas was much higher than the preponderance of “no” votes in cities. The proportion of “yes” votes was also highest in the areas most directly affected by the civil war – such as Choco Province in north-west Colombia, where 80 per cent of voters voted “yes”. All in all, the distribution of “yes” and “no” votes is a frightening reflection of the same conditions that previously led to the violent conflict between the government and the FARC. For over 100 years, urban elites have shown little interest in conditions in rural areas. They have ceded power to the largest landowners, who together with paramilitary militias, have acted as de facto governing authorities locally. Most people who have been directly exposed to this bad governance voted “yes”, while those who have been little affected were slightly more likely to vote “no”. Another factor was Hurricane Matthew, now causing a state of emergency in the United States, which passed through parts of Colombia during the referendum. The figures show that the hurricane prevented many people in rural provinces – where support was greatest for President Santos in the 2014 general election and where most people were likely to vote “yes” – from voting. Without the hurricane, there would probably have been a clear majority in favour of the peace agreement. In any event – and as suggested by Jon Elster many years ago – it is no doubt true that the maximum punishment that the FARC is prepared to accept for its atrocities is lower than the minimum punishment demanded by the urban elites in order to gain the acceptance of a peace agreement. But one must consider these attitudes in light of Colombia’s extreme inequalities in income and political influence, and in light of those who will bear the burden of any continuation of the conflict. 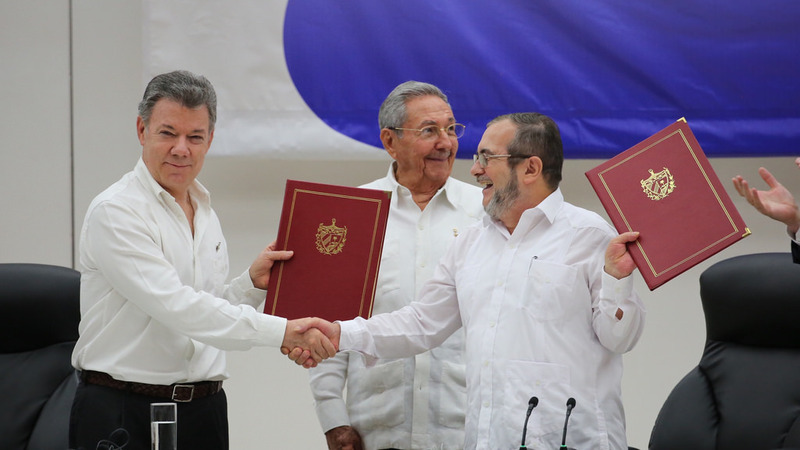 Although the best solution would have been for the FARC and the Colombian government to have shared the Nobel Peace Prize, the award of the prize may nevertheless put the peace process rapidly back on track.